2019 NFL Draft: Projecting the NFL Draft's First Round: Which Players Will Make the Most Impact? We are about a week and a half away from the 2019 NFL Draft, my personal favorite sporting event of the entire year. There’s nothing quite like seeing the new faces of the NFL enter the league, and watching how it changes the landscape of the upcoming season. Since it is so close, we have tons of information on who teams have been looking at to improve their rosters. And of course, this matters a ton for all forms of fantasy football. I’m going to do my best to project the skill players who will go in the first round of this year’s draft, along with giving some detailed information as to their potential impact at the next level. Let’s see which players will be shaping the league for the first time in 2019. The worst kept secret in football right now is that the Cardinals will be taking Murray with the first-overall pick in the Draft, and likely trading away Josh Rosen to another QB-needy team. New Arizona head coach Kliff Kingsbury has been effusive in his praise of Murray dating back to his time at Texas Tech. Having coached Patrick Mahomes, Baker Mayfield, Johnny Manziel and Case Keenum, Kingsbury certainly knows his way around talented QBs. Murray’s mobility makes him an instant fantasy starter, and will help to mitigate some of the issues the Cardinals have had along the offensive line. He ran for just over 1,000 yards and 12 TDs in 2018. Don’t sleep on Murray as a passer though. He just posted the second-best single-season passer efficiency rating of all-time, and was better than Mayfield was on a per-attempt basis. According to Sports Info Solutions, Murray is the top QB in this class in terms of both Expected Points Added per drop back, as well as On-Target percentage. He is an absolute stud. Lock has been very closely linked with John Elway and the Broncos, and this appears to be one of the free squares in mock draft contests. Denver has been very unsuccessful at bringing in QBs since Peyton Manning retired, trying everyone from Paxton Lynch to Case Keenum and now Joe Flacco. They will need to find a QB of the future soon, and many believe that the strong-armed Lock will be that guy. Should he end up in Denver, it is very likely that Lock would sit out most, if not all, of his rookie season, unless the Broncos were to go completely into the tank. Lock was a four-year starter at Missouri, but did not develop as many had hoped over his time there. His career yards per pass attempt of just 7.9 is not what you typically look for in a future starter. My guess is that whatever team selects Lock is looking for another QB in the not-too-distant future. As early as just a few months ago, Haskins was in contention to be the top pick in the draft. Since then, Peter King has reported that Haskins is “sinking,” and it appears that he may not truly be a contender to go inside the top 10 of the Draft. The Bengals just made a coaching change, hiring Zac Taylor, who was an assistant under Sean McVay the last two years. Current starter Andy Dalton is 31 years old, has played at a mediocre level and has no guaranteed money left on his contract. This appears to be the perfect chance to set the team up for the future. Haskins was excellent in his one year as the Buckeyes starter, averaging 9.1 yards per pass attempt, and tossing 50 TDs to just eight INTs. One-year starters are always risky, but Haskins has been accurate (70% completion rate in 2018), and we’ve seen what teams can do with QBs on rookie deals, even if we still question their talent. Haskins could certainly kick start a rebuild of the Bengals under the new coaching staff. His short-range accuracy would be particularly good for slot-man Tyler Boyd. The Packers have finally moved out of the stone age on offense and have hired forward thinking Matt LaFleur to replace Mike McCarthy. Unfortunately, the team is barren of real receiving talent. Sure, they have some young players who contributed in 2018, but outside of Davante Adams, Aaron Rodgers doesn’t have the pieces in place to get back to an All-Pro level. It makes sense for them to spend some early picks on the offensive side of the ball. Hockenson is regarded by many to be one of the best TE prospects of the past five years. He has just 1,080 yards and nine TDs in his two seasons at Iowa, but he had to play with Noah Fant, who is the TE2 in this class, and was part of a very pedestrian passing game. Hockenson is 77 inches tall and 251 pounds, and posted insane agility and explosion numbers at the Combine. His 4.7 second 40-yard dash is average, but for a player already regarded as an excellent blocker, it is more than adequate. TEs typically take some time to develop in the NFL, but an exception may have to be made for Hockenson if he is able to link up with Rodgers. Baltimore is going on year 57 of needing a WR, so they’ll probably take a TE at 22 instead. But in all seriousness, the team needs to improve its weaponry in order to get the most out of Lamar Jackson. Right now, the Ravens are set to open up the year with Willie Snead and Jordan Lasley as their top two WRs. Metcalf is one of the most polarizing prospects in the entire draft. His size and speed are prodigious, having run a 4.33 40-yard dash at 75 inches tall and 228 pounds. However, he suffered multiple injuries as a college player, and was less productive than teammate A.J. Brown. Still, Metcalf played Brown to a draw in 2018 before losing the rest of his season to injury, and has been incredibly efficient. A linkup with the Ravens would be a particularly good fit, as Metcalf’s deep-ball prowess would force defenders out of the box, and allow Jackson to have easy lanes to throw or run into underneath. The Raiders have stripped their team down over the past year, with Jon Gruden starting his 10-year contract with the team. They need offensive talent at every position, and having just lost Jared Cook in free-agency, they could certainly use a talented receiving option at TE. Picking three times in the first round allows them to do that. Fant had to compete with Hockenson at Iowa, but just because they play the same position doesn’t mean they are the same type of player. Fant ran a 4.5 second 40-yard dash, and is an elite move TE similar to Evan Engram. He has a great chance to come in and produce right away because he is already so well developed as a receiver. Don’t expect whoever drafts him to ask Fant to block. He’s out there to rack up catches and TDs. The Giants continue to be the laughing stock of the NFL. General manager Dave Gettleman says they are rebuilding, but also proclaims that they can compete now. The team traded away Odell Beckham, but signed Golden Tate and gave Sterling Shepard an extension. If they truly want to hit the reset button, it will require getting away from Eli Manning and finding a young talent at QB. Insert Jones, who is predictably the least inspiring of the first round-caliber QB prospects. Despite playing for David Cutcliffe, who many consider to be a QB guru, Jones averaged just 6.4 yards per attempt for his career. Per SIS, he is outside of the top 10 QBs in this class in EPA per drop back, and ninth in Independent Quarterback Rating. This is not someone who belongs in the first round, and I doubt he is the answer for the Giants (or anyone else) long term. As I mentioned earlier, the Raiders need a lot of help in terms of offensive talent. It is no different at RB. Oakland recently signed Isaiah Crowell, but it was for under $1.5 million and won’t prevent the black and silver from adding a more talented player to the fold. Jacobs is a perplexing first-round RB prospect. He spent much of his career playing second-fiddle to Damien Harris, but was excellent in Alabama’s 2018 playoff run. He has under 1,500 yards rushing in three seasons, but caught 48 passes. At his pro day, Jacobs ran a very disappointing 40 time, being clocked anywhere from 4.6 to 4.66 seconds. Of course, the name of the game at RB is volume, so Jacobs could definitely produce if given the work in Oakland. But I do not believe him to be a game-changing or otherwise special talent. The Redskins are another team that appears to be completely barren on offense. They lost QB Alex Smith to compound and spiral fractures in his leg, and he is expected to miss all of 2019 if he even takes another snap. Case Keenum is now in tow and should be their 2019 starter. Unfortunately, they have no skill players. Jordan Reed is a shell of his former self, and a receiving tandem of Josh Doctson and Paul Richardson isn’t exactly striking fear into opposing defenses. “Hollywood” Brown is the most dynamic playmaker in the entire draft. 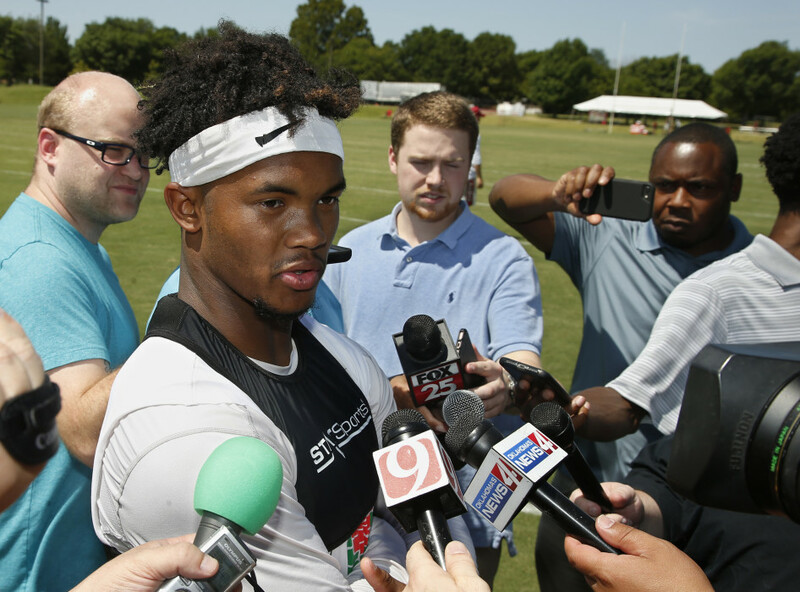 He averaged 18.3 yards per reception for his career at Oklahoma, and boasts world-class speed. Brown has the ability to line up all over the formation and can be used similarly to how the Chiefs have deployed Tyreek Hill. The only real question on his resume is health, after suffering a Lisfranc injury at the end of Oklahoma’s season. His foot looked good in medical re-checks recently, and he resumed running in late March. All signs point toward Brown being healthy to start his rookie year, and that makes him supremely dangerous at the next level. Brown out-produced the aforementioned Metcalf, but projects as a big slot WR at the next level. That limits his opportunities to fit into an NFL offense, as well as go in the first round. That said, he has impressive athletic qualities and was the go-to option in the Mississippi passing game for two seasons despite playing with other NFL-caliber players. He is a candidate to perform very well in PPR formats, where his ability to run short routes and make contested catches gives him high reception and TD upside from the slot. Smith is nowhere near as talented a TE prospect as Hockenson or Fant, but could sneak into the first round if the Patriots look to replace Rob Gronkowski with a rookie. His retirement has left a sizable hole in the New England offense, but I question Smith’s ability to fill that role right away, if ever. He falls somewhere in between the Iowa TEs athletically, and was not at all productive until his final season. Should an Iowa TE wind up in New England, I will be buying, but Smith will likely not produce for some time. Butler is a size/speed freak in his own right. Standing at 77 inches tall and 227 pounds, Butler ran a 4.48 40-yard dash, and had a combined 164 inch broad and vertical jump. He also was extremely productive in his final season at Iowa State, averaging 3.65 receiving yards per team pass attempt. The only real blemish on his resume is age, as Butler will be 23 years-old as a rookie. There is a wide range of outcomes here, but a good QB and immediate role will do well to make him productive early on. Harry is a similar prospect to Mississippi’s Brown, someone who will likely be a big slot WR in the NFL. However, he has a few things going his way that make him a better prospect. For starters, Harry is about half a year younger, breaking out at just 20 years of age. He was also more productive over the course of their respective careers, with contributions in the run and return game as well as those as a receiver. He is one of the top three wideouts in this class in my opinion, and should help an NFL offense right away. I am a promoter at DraftKings and am also an avid fan and user (my username is amicsta) and may sometimes play on my personal account in the games that I offer advice on. Although I have expressed my personal view on the games and strategies above, they do not necessarily reflect the view(s) of DraftKings and I may also deploy different players and strategies than what I recommend above. I am not an employee of DraftKings and do not have access to any non-public information.